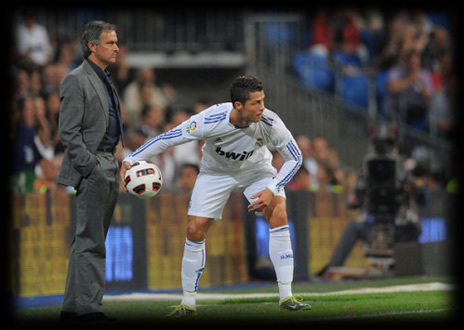 01.02.2011 » José Mourinho: "Cristiano Ronaldo will score again soon." José Mourinho said he's confident that Cristiano Ronaldo will score again soon, but he's worried that some players are getting too tired after having to play so many matches this season. José Mourinho showed up on the pre-match press conference to comment about the current form of Real Madrid and what we can expect from the second leg match against Sevilla, in Copa del Rey. The portuguese coach, assumed the lack of good performances lately and justified it by pointing that some players are just too tired from playing in so many matches. Mourinho also appealed the fans to come to the stadium this wednesday and help the team reaching the final of the Copa del Rey. José Mourinho said that the fatigue that is affecting some of his players is rather mental than a physical one. "We played 9 matches in January and there are some players who aren't used to this. In the last years, Real Madrid got knocked out from Copa del Rey or the Champions League in early stages and a few players are being affected by the fact that they have to play for several competitions at the same time and for so long. Next year, I'm sure we'll won't have many problems as this year, regarding this mental fatigue, because these players will be better prepared." The portuguese coach also said he believes that Real Madrid can beat Lyon for the Uefa Champions League and that Pepe is one of the most influent players in the team. "I believe we can beat Lyon. We had a long period this season where performed very well, but now we are struggling a bit. However, I believe we'll start playing better when Pepe returns, because he's great at pressuring and allow us to regain the ball possesion more often and more quickly. He's a central defender, but	we can feel his absence." José Mourinho also approached the Cristiano Ronaldo topic and raising concerns about his lack of goals in the last matches: "Ronaldo is a fundamental player and he'll keep doing his best. He's having a tremendous season and he'll surelly score again." When asked to comment on Sevilla's provocative video from last week, the portuguese coach said it didn't have any effect on him. Real Madrid plays this wednesday for the Copa del Rey second leg against Sevilla, after having won last week by 1-0. Don't forget that you can follow Cristiano Ronaldo in this game, live, here on Ronaldo7.net.